Join us this coming friday where you will find handcrafted crystal pendants made with loving intention - a portion of the money from this show will go directly to supporting Philly animal shelters. Before you head back to school, hit the books, and no longer have the time to be concerned with what your hair is doing... come to Lather! Students receive 10% off any 1 service thru September. On October 10th, Lather will host it's next installment of Style Lab. Style Lab is a series of classes dedicated to at home hair care, skin care, makeup, styling, etc. Come hang for a chill night of sharing and caring! 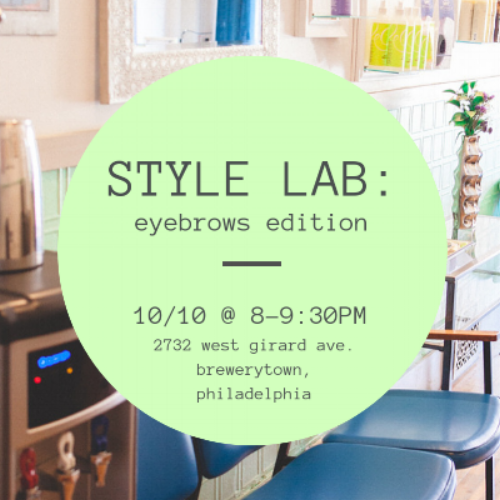 This particular Style Lab will be focused on everything eyebrows. Our eyebrow expert Hannah will be coving: the basics of individual brow formations; how to fill brows using the latest techniques; and how to best maintain the best eyebrows through waxing, tinting, etc. Tickets for the event will be $10, at the door, with a discount offer to be used towards a future service at Lather. Please join us for light refreshments at 8:00pm, class starts at 8:15pm sharp. We are excited to announce the recent addition of Davines to the thoughtfully curated list of products and color we use here at Lather. We feel their sustainable beauty approach is truly in line with Lather's goal to provide bespoke and holistic services for our clients. A line of delicate, hydrating and nourishing products formulated with the highest percentage of naturally derived ingredients possible (98%-100%). The line consists of 4 products that have been created to be used on the face, hair and body. Authentic is formulated without parabens and sulphates and uses organically derived Carthame Oil as its main active ingredient. This line is suitable for all hair types and all OI products contain Roucou oil, which has a restructuring action on the hair and favors growth. An ammonia-free permanent color line. The formula also includes natural anti-oxidants, giving anti-aging properties that protect the hair. As many of you have heard, the next year at Lather is bringing big change for us! While we don't have an exactdate set, we will be moving by the end of the year. Don't worry, you won't have to look too far to find us, we are only moving TWO DOORS DOWN to the corner of 28th and Girard Ave. We are so excited to see you all in a brand new location. Our new space will include all the service you have come to love at Lather. We will be adding more staff to accommodate your needs and will be starting our search for the perfect salon receptionist so we can serve you better. We hope you are all as excited as we are, this big change will mean a better experience for our guests and an opportunity to serve more of our community. As we grow and make this transition, we will be implementing some new systems to help us, as service providers, work more efficiently. Firstly, a few months back we switched over to gender neutral pricing. That means our prices reflect time spent on your service, rather than length of your hair or gender. Just a reminder, quick cuts and maintenance trims are $30-$45 and are based on both time and the skill level of your stylist. The top tier level stylists will charge $45 for these services. Also, the lazy days of summer are coming to a close and we expect to be getting very busy! This means that if you need to cancel last minute, we may not be able to get you back on the schedule in a timely manner. Please be mindful of your stylist and if you need to cancel, let us know as soon as possible. As of October 1st, there will be a small increase in service charges. The website will be updated to include all changes. Our goal is to provide you with affordable and competitive top quality service. From the bottom of our hearts, we want to thank you, our clients, friends and family, for choosing the staff at Lather as your hair and skin care specialists. It is our mission to help you look and feel your best. We will continue to do so for years to come.